Do you see now what I meant when I said that Terry’s young people are always in motion? It’s amazing to me that such charming, attractive, readable work is not available in affordable reprint editions. 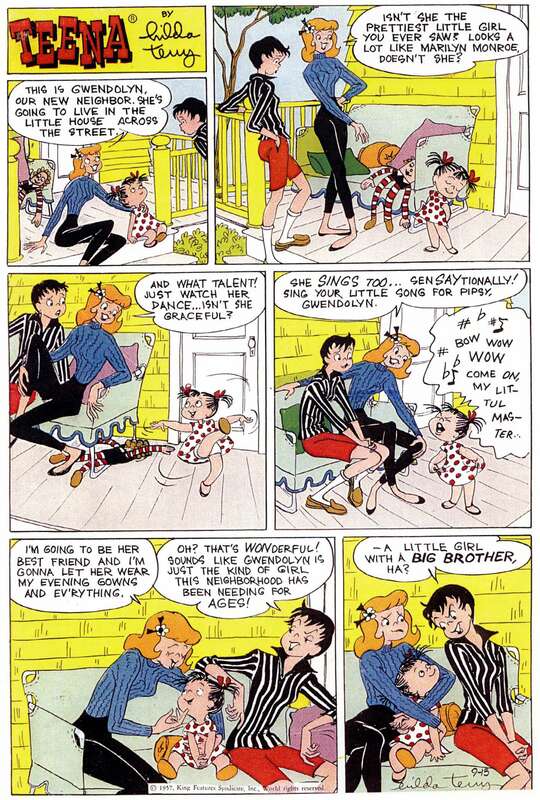 Yes, the gender divisions light-heartedly depicted in these particular examples are a little out of date; nonetheless, it seems to me that “Teena” would have tremendous appeal to fans of Little Lulu, Archie Comics, Harvey Comics, Nipper, Blondie, etc. — all of which have experienced a recent resurgence of interest and are in the process being systematically reprinted for new generations of readers. Hilda Terry was born on 15 June 1914. 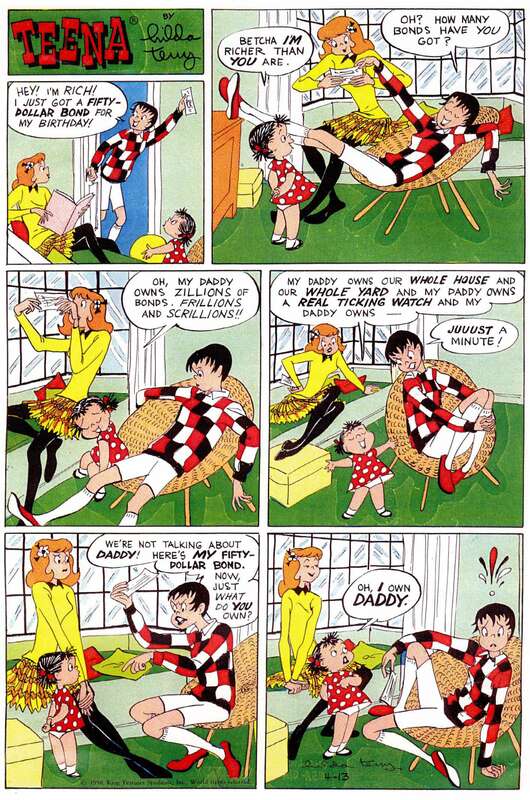 In addition to drawing “Teena” for twenty years, Terry sold numerous single-panel cartoons to The Saturday Evening Post, The New Yorker, and other coveted markets. 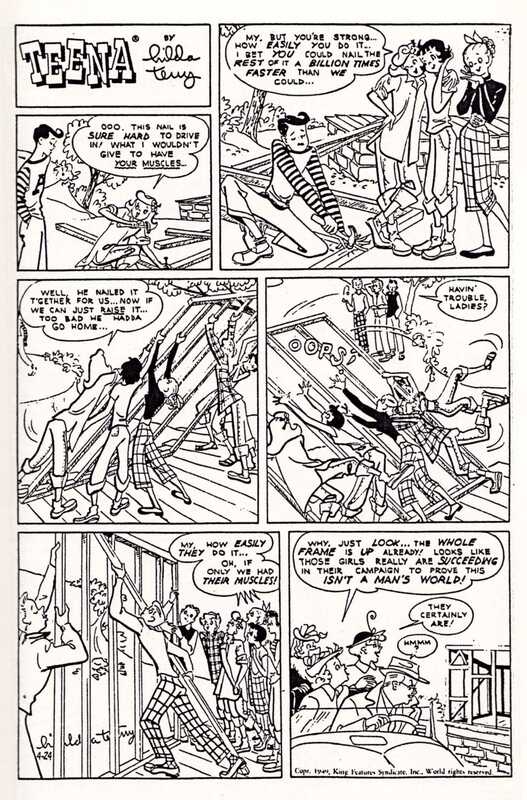 In 1950, she became the first woman allowed to join the National Cartoonists Society, which up until that point had only allowed male cartoonists to join, and she became a vocal advocate for other women to follow in her footsteps. 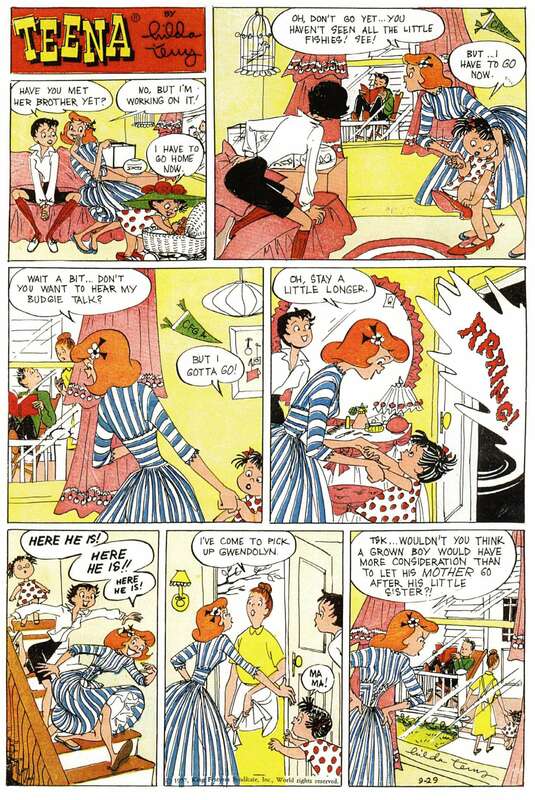 She was a pioneer of early computer animation. 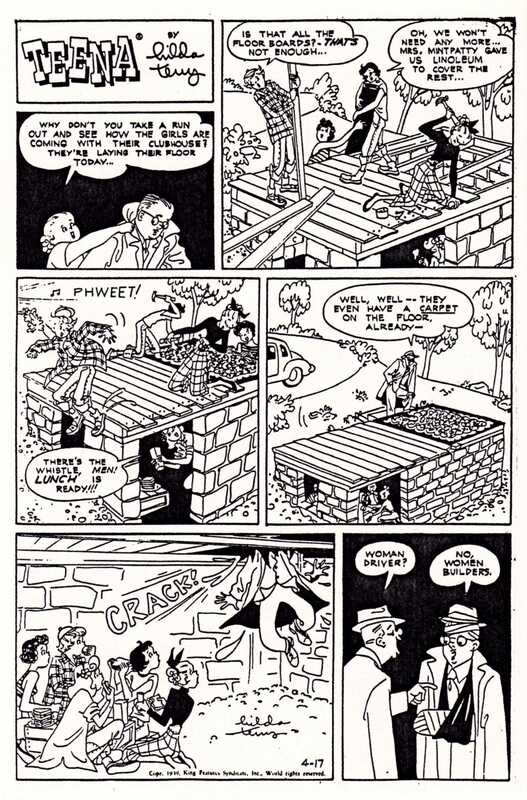 She received the Animation Award from the National Cartoonists Society in 1979. She taught at the Art Students League well past usual the age of retirement. 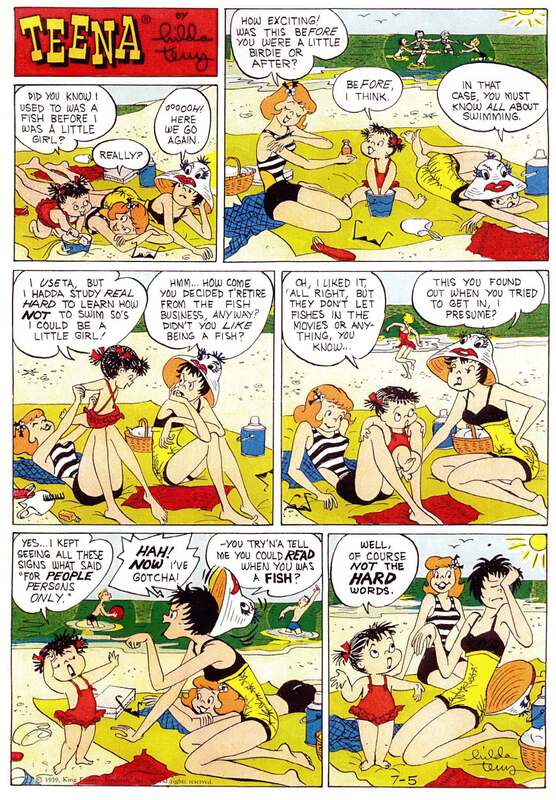 She was elected to the Friends of Lulu Women Cartoonists Hall of Fame in 2001. She died 13 October 2006, at the age of 92. 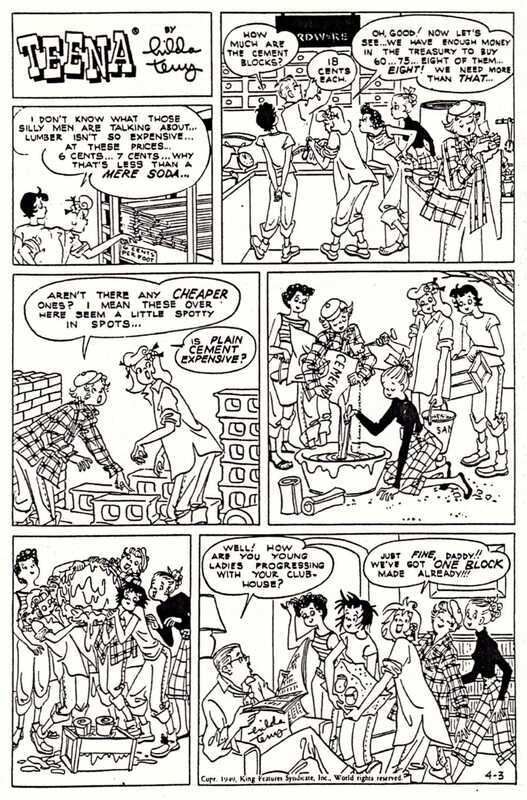 “If you do a comic strip, you don’t want it to be forgotten.” — Hilda Terry, MoCCA 2006, as reported by The Beat.